Since you’ll pay a lot of taxes in Germany, why not check what tax subsidized pension plans Germany offers and if they would work for you. 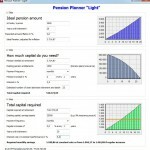 At the beginning lies an assessment of your pension goals and what you have already done to achieve them. You can actually see for yourself how you are doing to this regards when using our unique little pension planner which you can find here on our website. If you are an employee and somebody told you that a RIESTER plan is no good for you, he or she has not understood the system yet. Unfortunately most of the pension plans in Germany come with heavy front-loaded costs – something that is not good for those Expats who only plan to stay a few years in Germany. But there are ways and means around this, we can help you to find plans with either strongly limited initial costs or even where the costs are only deducted pro rata (pay as you go) and thus work much better for Expats. We can also offer you fee-based advice, so that no commissions at all are being deducted. Or perhaps a RÜRUP pension plan is better choice for you – especially if you are self-employed it is basically the only real tax saving plan that’ll work for you. The same which was said about the cost structure for RIESTER plans above applies to RÜRUP plans – we can help you find the few ones where initial costs can be strongly limited or even fully avoided based on so-called „Netto-Tarife“ for which we can offer you our fee-based advice. And all employees in Germany have a legal right to participate in a bAV (corporate pension plan available for all employees). If your company has its own pension plan, we are happy to check it out for you and tell you, if this would work for you, given your very own personal circumstances. And if your company does not offer their own plan, you have the legal right to choose out of a multitude of plans – and we’ll help you to do it in such a way as to limit costs and increase your profits and tax savings. Of course we offer also all kind of International pension plans as well if you want to keep it flexible and mobile. However, be aware of the fact that there are certain institutions and companies in Germany which target Expats and sell so-called Offshore pension plans like they were the best thing since bread came sliced. Most of these salespersons (they are not truly independent advisors or brokers and often lack formal education and training in line with German or EU-wide regulations) and companies misinform about the tax issues around these plans and fail to disclose the full initial costs of these products – you will be lucky to get a report as to what you have purchased! It may only be years down the track when you discover that the first 2years or so of these products massive amounts of your dearly accumulated pension capital are siphoned off to pay large unwarranted commissions to these so called advisors. This means that you could well find your investment only starts after Year 3 and if you cancel these products you will be lucky to get any money back! And finally if you ever worked in the UK, you may benefit from a transfer of your pension from the UK into a German scheme that complies with UK legislation. Once again be wary of the untrained predatory advisors out there – have you ever had a cold call from one of them? If so, cold-calling is illegal under German law and already a real warning sign if someone who offers you advice is violating such important regulations and consumer-protection laws. Also make sure you receive a full disclosure of the licenses any advisor who is in contact with you has to provide upon first contact according to German laws. In certain situations it may be beneficial to transfer out of a UK scheme into an alternative scheme including a Qualifying Recognised Overseas Pension Scheme (QROPS). These schemes have confirmed to the UK Her Majesty’s Reevenue and Customs (HMRC) that they comply with UK law. None of these schemes have been approved by HMRC, however we here at C R & Cie. and our UK Associates have completed thorough due diligence on these schemes and have independently assessed whether they meet UK standards in full. Something that is fairly new in the German Expat market where mainly overpriced offshore schemes have simply been sold with little regards to the benefits and/or costs to the unsuspecting investor. This is important as HMRC can levy large tax penalties if the scheme you transfer into is not UK compliant.. C R & Cie. and our UK Associates are vocal advocates of quality advice. Both ourselves and our UK colleagues have seen the losses created by bad cross border pension advice. We offer an independent co-joined advice service of a standard so far unheard off in Germany, an advice process that has only ever your best financial interest at the core of it. We have a long established relationship with our UK Independent Financial Advisor (IFA) partner, a team of like-minded colleagues who are extremely well versed in TVAs (Transfer Value Analysis) and who will work alongside us delivering a 3 pairs of eyes advice process. Though not mandatory for all pension advice we believe in conjoined advice for all our clients with UK pensions and investments. Our advice process for QROPS is fee-based and without hidden costs, commissions or kickbacks – we are fully transparent when dealing with our clients You will not find your pension fund performance impacted by undisclosed charges or hidden and riddled with undisclosed commissions. And if you have been unfortunate enough to sign up for an overly expensive QROPS-transfer already in the past, we can also offer to assist you in transfering out of such schemes offshore that are just churning your investments and reduce the ongoing performance and value by adding constantly new costs and charges on top of other over-priced and often intransparent administrative costs and commission. Last but not least we can also help in managing or consoldidating existing 401K pension plans in the US. We are cooperating with yet another large and specialized IFA in the UK to this regards who has more than a decade of experience in catering to US Expats.